Cybernetic Enhancement: Cyborg Superman was created by Brainiac. When Zor-El lie dying at the machine's feet he was enhanced and perfected to Brainiac's liking and sent forth to find perfection in the universe. Invulnerability: Cyborg Superman is immune to most, if not all, forms of damage. 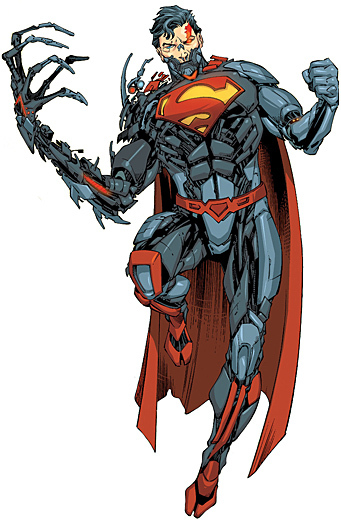 Metamorphosis: Cyborg Superman's right arm can shapeshift into whatever means he desires. This ability is limited why the technological means available to him, this means he can extend and expand his arm but only to conceivable limits. Zor-El is the younger brother of Jor-El, father of Superman (Kal-El), he is also the father of Supergirl (Kara Zor-El). Zor-El was convinced that Jor-El was wrong about the fate of Krypton and tried to convince him to move to the city of Argo, which he was planning to save by utilising Brainiac’s encapsulating technology. Zor-El’s plan did not come to fruition before Krypton was destroyed, however a beacon signal he sent was received by Brainiac, who recovered Zor-El’s badly damaged body. Believing Zor-El to be worth saving, Brainiac altered his DNA and RNA sequences, wiped his memories and replaced the rest of his body with cybernetic parts. Brainiac then set him the task of seeking out perfect specimens, worthy to be cybernetically transformed.